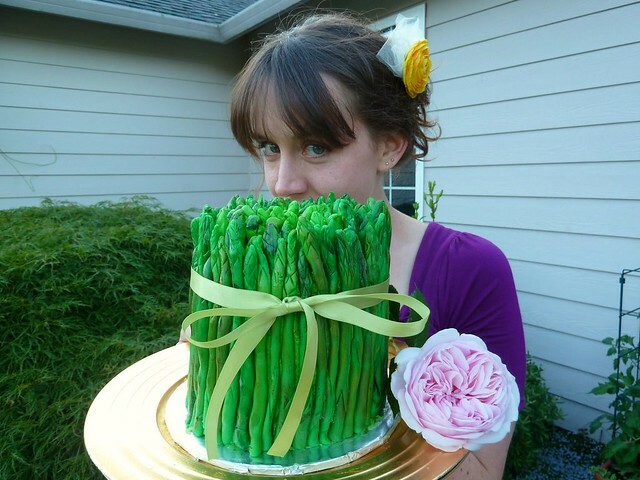 From the moment I first spied Rosie’s breathtaking Asparagus Cake over at Sweetapolita, I knew I would try to make one myself. I only needed an excuse to make an asparagus cake. As you read yesterday, our recent garden-themed birthday party was the perfect opportunity. Having only worked with fondant one time (four years ago), I knew that I would have to approach the project by not taking myself too seriously. Fondant is kind of like play-dough, right? So, I bought a big bin of fondant and started playing around. To make each spear, I started by rolling a ball of fondant, about one-inch in diameter. Next, I rolled it into a skinny cylinder. To get the leaves of the asparagus, I used a small paring knife. I made a few slices into the sides of the spear for lower leaves, and then made several “V” shapes at the top. I found that putting smaller and smaller cuts at the very top of the spear gave a more authentic appearance to the bud. Because even my small cake required what seemed like a million asparagus spears, shaping all of the spears was easily the most time-consuming aspect of this cake. I learned quickly not to work the fondant too much, or it would get sticky. Dusting on some corn starch helped bring it back to a workable consistency if this did happen. Because I knew the asparagus would require some height, I made a four-layer carrot cake, six inches in diameter. 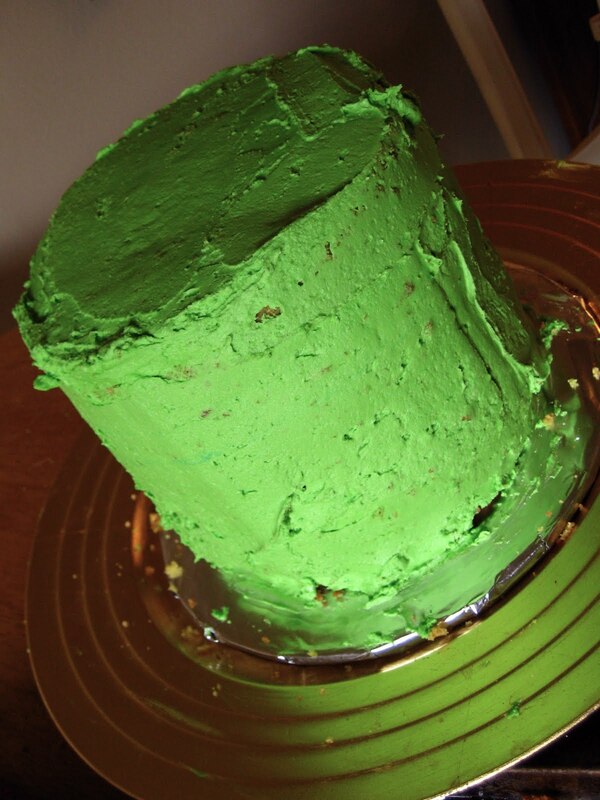 Once I iced it with green buttercream frosting, it was ready to be asparagus-ed. I found that the spears stuck to the cake better if I painted one side of them with some light corn syrup before attaching them. 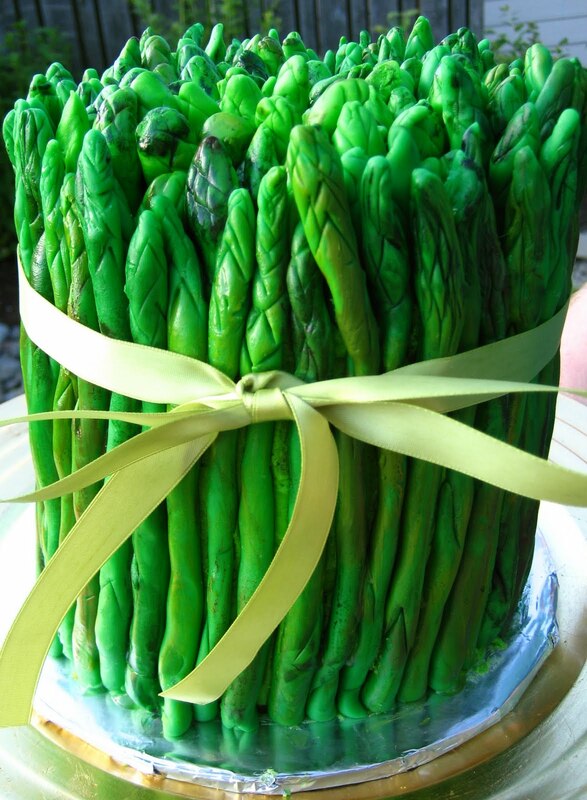 For the top of the cake, I attached a bunch of mini asparagus spears. For the final touch, I painted on three shades of food color dust: a lime green, a dark green, and red. This made each spear unique and definitely gave the asparagus a more natural appearance. While this cake took a lot of time, it was a blast to make and to show off. While it didn’t quite capture the elegance and delicacy of Sweetapolita’s cake, I liked how bright and almost cartoon-like my cake turned out. I consider this to have been a very successful experiment! THIS IS AMAZING!!! Well done Lindsey – your cake is gorgeous! Wow!! I love this cake. I’ve admired it on sweetapolita’s blog. You did an amazing job! What a great cake, nice work! You know what? I like yours better. It walks the very thin line between cake and realism. 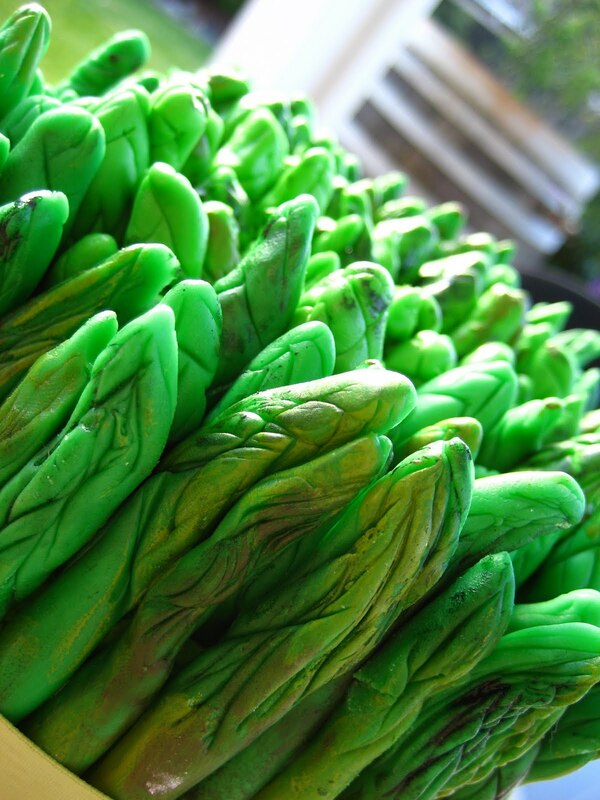 The other one, while truly amazing and a work of art, was a little too asparagus-y (and I <3 asparagus). Awesome. You did an awesome job! I love it. Nice way to explain This cake.